I’m going to jump right in and introduce you to rob mclennan, although I do recognize some readers are familiar with and have been introduced before. For those who aren’t quite familiar with mclennan, he was born and still resides in Ottawa. He’s written over 20 trade books of poetry, fiction and non-fiction. He’s also an editor and publisher, organizing and operating journals and various works on the World Wide Web, including (but not limited to) above/ground press, as well as Chaudiere Books with Jennifer Mulligan. As I started to research and report on the city’s realm of poetry and fiction writing, mclennan’s name was mentioned on more than one occasion. I felt impelled to pick his brain, to get his perspective on the industry pros and cons. Bearing in mind that mclennan is both intensely involved in writing and publishing in Ottawa, I was curious as to whether or not he notices collective strengths or weaknesses of local authors. His response surprised me and immediately had me thinking. My questions up until this point had been largely focused on what there is to gain by way of coming together with other, local authors. I had never asked myself or asked an author what there is to lose. I’ve been convinced cliques developed elsewhere because there are less people here – there is less competition. Of course this may hold true, but perhaps it’s also because there is nothing to compete for. It’s an interesting thought I’ll very well come back to. mclennan points to the VERSeFest poetry festival as an example of Ottawa authors working collaboratively. This festival is made up of every Ottawa reading series (written and spoken word poetry) and will take place March 12th until the 17th. mclennan is not typically one to experience writer’s block, he said. However, in the case he does, he reads all he can. He also frequents local coffee shops and a pub to do much of his writing. “I’ve been writing in public for 20 years. It allows me to focus in a way that home doesn’t always: I don’t have to worry about telephone, internet, dishes or any other distractions. I can just sit with the work,” said mclennan. That’s all I have for this morning – a glimpse into another name and face you’ll see, exploring this scene. 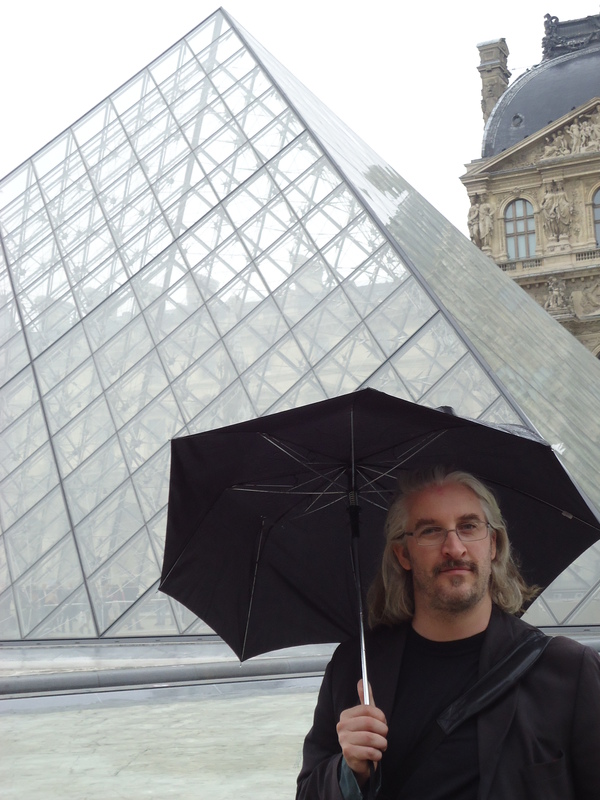 Photo provided by rob mclennan, taken at the Louvre Paris France by Christine McNair, October, 2012. Please do check out rob’s blog, visiting http://www.robmclennan.blogspot.com or Chaudiere Books at http://www.chaudierebooks.com.